proved that it was only phase one of this sturdy garden flower’s coming of age — and each phase was striking unto itself. The first shot reveals a flatter flower, with only about three layers of petals that curl inward and have a decidedly green hue. The second photo, taken several days later, shows the same flower, adding more layers of petals at its center (click on the images to enlarge for a closer look) and taking on paler more yellow tones, too. In the final shot, you can see that the shape of the flower has changed a lot through this evolution: it’s now morphed into a rounded flower, with much more depth due to the multiple layers of petals. 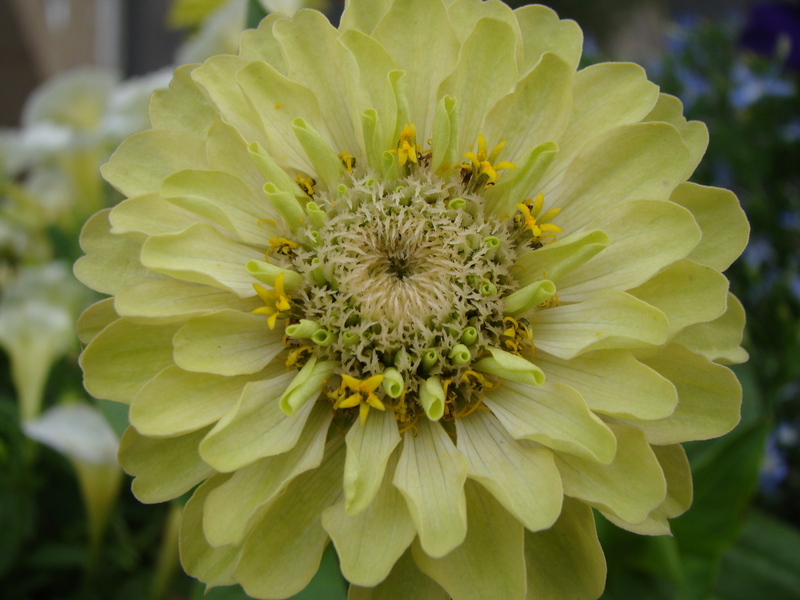 You’ll notice as well that in this third picture the green tint, which gives this zinnia its common name, is most pronounced on the younger petals unfurling at its eye. So, from a green, showy fresh blossom to an impressive mature specimen, there is much to envy in this popular garden flower. Note: I’ve grown this annual for several years now in my balcony container garden, and it seems to do well when sown directly outside. 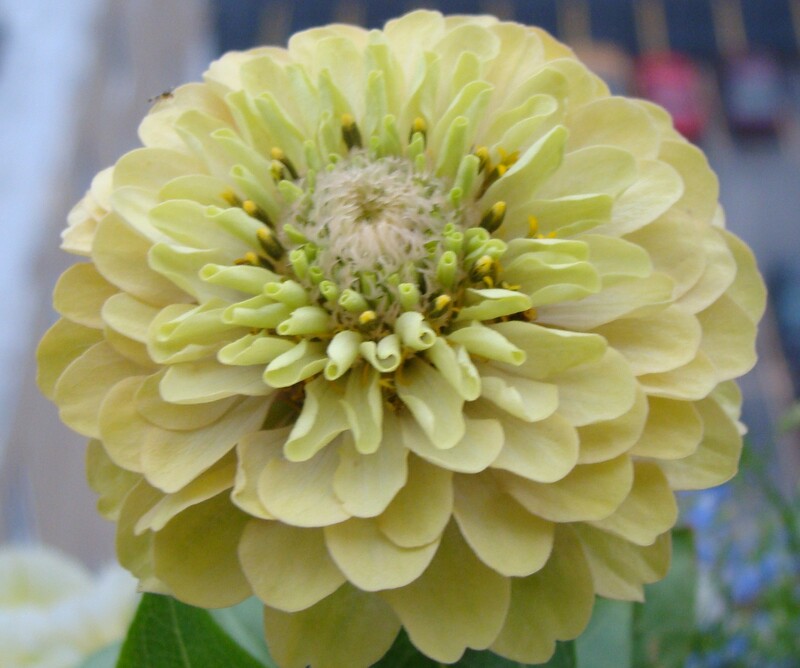 Zinnia is nice for adding height to the rear or center of containers. This is the second green-toned variety I’ve tried (“tequila lime was the first), but it comes in many colors… Let me know your favorite. I think the Zinnia gets even better as it matures. I am going to grow some next year on the allotment to bring home for cut flowers. They would be great in a cutting garden since they grow so quickly and have really strong stems. If I ever have the luxury of being able to grow one, I’ll include zinnia. This is an unusual shade for a Zinnia. Thank you for stopping by Keewee’s Garden. The little pink flower you asked about appears to be a Verbascum, and was given to me by a friend. It sure is a pretty little flower. 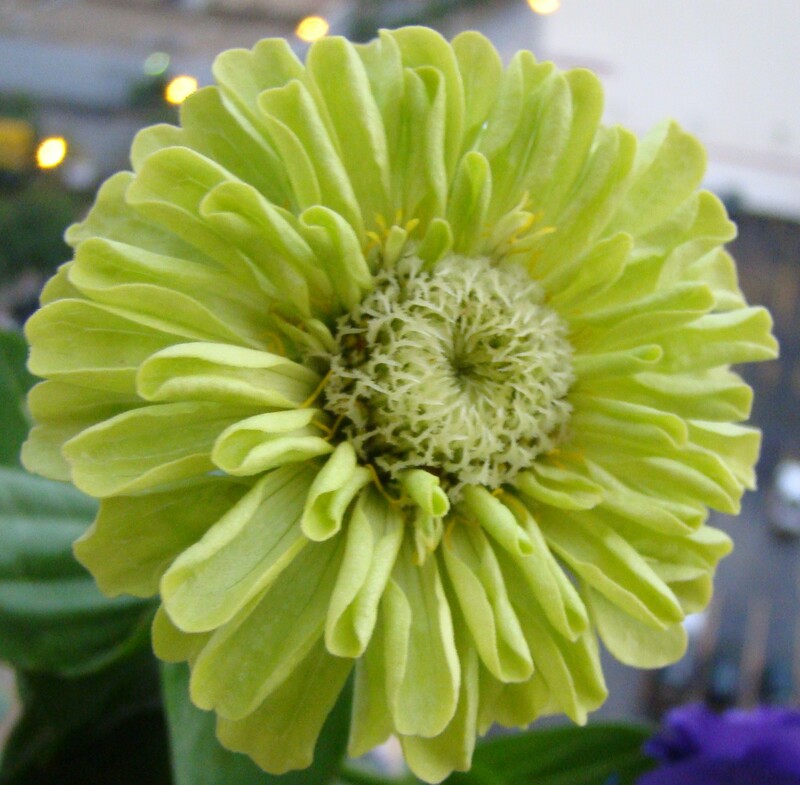 Love Green Envy, my favorite of all the Zinnias. I haven’t grown zinnia in a while but your post makes me wish I had. I had forgotten how interesting each bloom could be. Also, how many butterflies they attract. Do you get butterflies up on your balcony? I love zinnias and the myriad ways they continue to unfold. Sadly, mine haven’t done well this year but I’m hopeful for the next one. Lovely shots! Zinnias are a wonderful, sturdy – I once popped someone in the head with a zinnia on its stem and it survived – and happy looking flower!